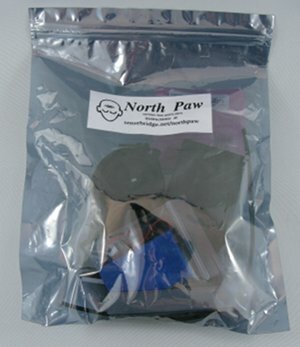 The older V1.5 North Paw kit uses a Lithium Polymer battery and includes on-board charging circuitry, making it very convenient to use – simply plug in a mini-USB cable (not included) each evening and it’ll be fully charged again the next day. The included LiPo battery is considerably smaller and lighter than the equivalent AAA batteries, which previous versions of the kit used. The V1.5 kit used to cost $149. The V1.5 kits are a considerable improvement over the older V1.0 kits. In addition to the support for superior LiPo batteries, the new kit includes much smaller laser cut acrylic enclosure for the electronics, a better anklet (now with velvet! ), and some substantial improvements that make the hard part of the assembly easier than before.